sierraclub.org - sierra magazine - nov/dec 2011 - this much mercury . . .
Rich Gelfond keeps his Oscar statue in a black cloth sack in the bottom drawer of his desk. He received it as CEO of the film-technology company Imax, for "the method of filming and exhibiting high fidelity, large-format, wide angle format, motion pictures," although when I read the inscription aloud, he feigns surprise, as if he's forgotten how he came to own it. "Is that what it's for?" he muses. "An Oscar's kind of like potato chips—when you have one, you need more. Kind of like tuna sushi." Tuna sushi—and the devastating repercussions of Gelfond's onetime passion for it—has been the topic of conversation for the past hour, and Gelfond smiles slyly and a bit ruefully at his joke. With his round face, long blond eyelashes, and startled blue eyes, he seems placid but with an underlying current of energy, like a guinea pig who just drank a latte. For years he was an avid tennis player who also loved running around the Central Park reservoir or near his home in eastern Long Island. But about six years ago he began to feel oddly off balance, as though he might fall at any moment. He tried running on grass instead of asphalt but finally had to give it up altogether. It was probably stress, he reasoned, opting to stick to tennis. It was only when he nearly fell over while trying to serve that he decided to see a doctor. More symptoms came to light in the physician's office. Gelfond had a tremor in his hands and had trouble putting his fingers together. A neurologist, worried that the symptoms pointed to a brain tumor, ordered an immediate MRI. But there was no tumor, and as he underwent a battery of increasingly unpleasant tests and scans, Gelfond's symptoms worsened. His feet tingled (a condition called neuropathy), and his balance became so off-kilter that it made walking difficult. "If I was with someone, I would walk close to them so, if I fell, I could grab on," he recalls. Then, six months into his illness, Gelfond's neurologist asked a seemingly random question: "Do you eat a lot of fish?" As he underwent increasingly unpleasant tests and scans, Gelfond's symptoms worsened. His feet tingled, and his balance became so off-kilter that he could barely walk. "As a matter of fact, I do," Gelfond replied. It turns out that he had been eating seafood at two out of every three daily meals as part of his healthy lifestyle. What he didn't know was that some kinds of fish—particularly the tuna and swordfish he favored—are high in mercury, a potent nerve poison. A blood test revealed that his mercury level was 76 micrograms per liter (mcg/L), 13 times the EPA's recommended maximum of 5.8 mcg/L. It was so high that he got a call from the New York State Department of Public Health, asking whether he worked at a toxic-waste site. "I was just so frustrated that I was trying to do something good for my body and in fact I was poisoning myself," Gelfond tells me, leaning forward in his chair. "I had no awareness." Neither did most of the people he talked to, including physicians. To them, mercury poisoning was something that happened to the mad hatters of the 19th century or to the victims of industrial waste in Minamata, Japan, in the 1950s. It didn't happen to 21st-century New York executives. Having found the source of his illness, Gelfond's neurologist had no idea how to treat it, and when Gelfond contacted other New York physicians, most told him that mercury couldn't possibly be causing his symptoms because adults aren't susceptible to mercury poisoning. "There has been a tendency to say adults are resistant," says Michael Gochfeld, professor of environmental medicine at New Jersey's Robert Wood Johnson Medical School, which has treated a number of people who have gotten mercury poisoning from fish. "We don't really understand why some adults are sensitive and others seem to be quite tolerant." The main prescription for Gelfond's mercury poisoning was to stop ingesting it. Once he eliminated high-mercury fish from his diet, his levels began to drop; within six months he was down to 18 mcg/L. One year after his diagnosis, he was able to walk without assistance. Six months after that, he was back to playing tennis. Today he says he's about 60 percent recovered. He still has trouble running long distances, and his symptoms resurface when he's fatigued. Mercury has changed his life forever. "You never hear about fish. Tuna fish—it's just one of those things you wouldn't think to be scared of." A few weeks earlier I'd spent the evening at a salon in Billings, Montana, watching stylists give people what amounted to very tiny haircuts. The Sierra Club was offering free mercury testing there and at other places around the country, and about 40 people had gathered at the Sanctuary Salon to provide hair samples for analysis. The room was perfumy with hair products and buzzing with blow-dryers. Young women sat down to have a few strands of hair clipped close to the scalp, murmuring the usual things women say in salons: "I hate my hair!" and "Can you get rid of the gray?" They also wanted to understand whether their own eating habits put them at risk. Tierani Bursett, 27, asked whether she should be concerned about the walleye she catches while ice fishing (she should). A local newscaster, who didn't want to be named, said she was "addicted to sushi" and wondered if she should be worried (yes). The mother of a four-month-old wanted to know if mercury passes through breast milk (it does), and an older man asked whether mercury is a concern for people over 60 (it is). Luzia Willis, one of the salon's manicurists, was feeling nervous about all the tuna she buys at Costco (with good reason). "Why is there extra mercury in the fish?" she asked. "What's causing it?" But What Fish Can I Eat? Click image below to see the full chart. The answer can be found all around her: at the Colstrip power plant east of Billings, which uses a rail car's worth of coal every five minutes (see "High Plains Poison," March/April 2010); in the coal-mining operations to the east and southeast; in the long chain of rail cars that chugs through town each night full of black ore bound for boilers across the country; and at the J. E. Corette power plant right in town. While there is always going to be some mercury in the environment—it occurs naturally in the earth's crust and can be released into the air during forest fires or volcanic eruptions—70 percent of what we're exposed to comes from human activities, and most of that comes from burning coal. 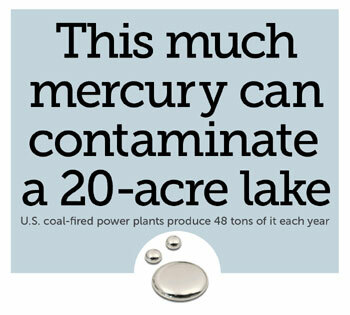 U.S. coal-fired power plants pump more than 48 tons of mercury into the air each year. The Martin Lake Power Plant in Tatum, Texas, spews 2,660 pounds per annum all on its own (it burns lignite, a particularly mercury-heavy form of coal). Compared with the vast amounts of mercury churning out of Asia, the U.S. contribution is fairly small—about 3 percent of the global total. Roughly a third of our emissions settles within our borders, poisoning lakes and waterways. The rest cycles through the atmosphere, with much of it eventually winding up in the world's oceans. Inorganic mercury isn't easily assimilated into the human body, and if the mercury emitted by power plants stayed in that form, it probably wouldn't have made Gelfond and many others sick. But when inorganic mercury creeps into aquatic sediments and marshes (as well as mid-depths of oceans), bacteria convert it into methylmercury, an organic form that not only is easily assimilated but also accumulates in living tissue as it moves up the food chain: The bigger and older the fish, the more mercury in its meat. It takes only a tiny amount to do serious damage: One-seventieth of a teaspoon can pollute a 20-acre lake to the point where its fish are unsafe to eat. Thousands of tons a year settle in the world's oceans, where they bioaccumulate in carnivorous fish. 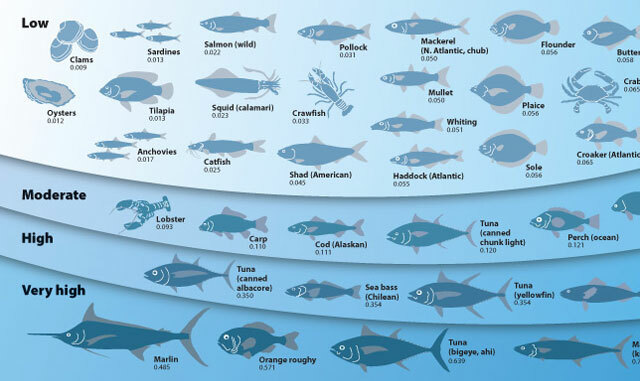 Forty percent of human mercury exposure comes from a single source—Pacific tuna. "Ninety-five to 100 percent of the methylmercury that we acquire in our bodies comes from the consumption of seafood," explains Stony Brook University professor Nicholas Fisher, director of the Consortium for Interdisciplinary Environmental Research, which oversees the (newly endowed) Gelfond Fund for Mercury Research and Education. (Seafood, in this case, includes fish from lakes and rivers.) When EPA researchers tested predatory and bottom-dwelling fish at 500 U.S. lakes and reservoirs in 2009, they found mercury in each and every one; close to half of the fish had levels so high they were unsafe to eat. Another 2009 study, by the U.S. Geological Survey, found mercury-contaminated fish in each of the 291 streams and rivers tested. Mercury pollution causes U.S. waters to be closed to fishing more often than does any other source of contamination. In March, after more than 20 years of delay, the EPA proposed a new federal air pollution standard for power plant emissions of mercury and other toxics. The new rule, which was vigorously opposed by the coal industry, will require power plants to use "maximum achievable control technology" to filter mercury from their smokestacks by 2014. The result of a 2008 lawsuit by the Sierra Club and other environmental groups, the rule is expected to cost industry more than $10 billion to implement. That may sound like a lot—unless you compare it with the cost of doing nothing. Dr. Leonardo Trasande, an associate professor of preventative medicine and pediatrics at Mt. Sinai Medical Center, did exactly that, in a study published in the American Journal of Industrial Medicine in 2006. He calculated that between 316,000 and 647,000 American babies are born each year with mercury levels high enough to cause measurable brain damage. Because every drop in IQ results in a loss of economic productivity, he estimated that the mercury emitted by coal-fired power plants costs the nation $1.3 billion each year. As he explained in a Senate briefing in 2005, "those costs will recur year after year, with each new birth cohort, so long as mercury emissions are not controlled. By contrast, the cost of installing stack filters is a one-time expense." Many of the same coal-industry supporters who question the science of climate change also deny that mercury harms public health. "To actually cause poisoning or a premature death you have to get a large concentration of mercury into the body," insisted Texas representative Joe Barton at a congressional hearing on the new EPA pollution rules earlier this year. "I'm not a medical doctor, but my hypothesis is that's not going to happen!" The experiences of fish lovers like Gelfond and actor Jeremy Piven (who famously pulled out of a Broadway show, citing mercury poisoning) refute Barton's hypothesis, but theirs are admittedly extreme cases. After all, the average American eats less than one serving of fish per week. Many eat far more, however; one researcher extrapolated from existing data that there are up to 184,000 people in the United States with blood mercury levels above 58 mcg/L, a level at which they would likely show adverse symptoms. The symptoms of mercury toxicity are fairly well established. They include lack of balance and coordination, trouble concentrating, loss of fine motor skills, tremors, muscle weakness, memory problems, slurred speech, an awkward gait, hearing loss, hair loss, insomnia, tingling in the limbs, and loss of peripheral vision. Long-term exposure may also increase the risk of cardiovascular and autoimmune diseases and reduce the concentration and mobility of sperm. What's unclear is how much mercury it takes to make you sick. Nearly everyone feels fine when the level of mercury in their blood is below 5.8 mcg/L, which the EPA says is safe for pregnant women. And most—although not all—exhibit symptoms at 100 mcg/L. But some people show symptoms with levels as low as 7 mcg/L, and others feel right as rain despite being above 100 mcg/L. Physicians speculate that susceptibility to mercury could be genetic, or the result of diet or stress. It also seems that people can have mercury-related impairments without realizing it. In an Italian study from 2003 comparing 22 men who frequently ate tuna with 22 who didn't, the tuna eaters (who had a mean level of 41.5 mcg/L) fared significantly worse on cognitive tests, despite having no outward symptoms of poisoning. One thing that isn't in question, though, is that developing fetuses are particularly sensitive to the toxic effects of methylmercury. Two out of three large-scale studies have found that children born with it in their system have trouble with coordination, concentration, language, and memory—and continue to have the same deficits many years later. Nancy Lanphear is a behavioral developmental pediatrician who works at a clinic in Vancouver for children with disabilities like autism or attention-deficit/hyperactivity disorder. Several years ago, a mother came into her clinic with a four-and-a-half-year-old girl who had cerebral palsy as well as speech and motor delays. But what attracted Lanphear's attention was that the child was drooling. "I'm looking at this four-year-old and saying, 'This is mercury,'" Lanphear recalls, hypersalivation being a classic sign of mercury poisoning. The child's chart showed that a heavy metals screening at age two had found high mercury levels in both mother and child, as well as in the child's grandfather. The mother recalled being encouraged by her physician to eat fish during her pregnancy; she ate tuna or other seafood two to four times a week, sure that she was helping her baby's development. "She knows that she's not to blame, that it was inadvertent, but there's still some grief there," Lanphear says of the mother. "It's not something that's going away, even though the child's mercury levels are now normal. The damage was done to the developing brain." Lanphear uses the story to remind obstetricians and pediatricians to be on the lookout for mercury poisoning in their patients. The EPA estimates that at least 8 percent of U.S. women of childbearing age have blood mercury levels above 5.8 mcg/L. If you zero in on communities that regularly eat fish, the prevalence is much higher. In the Northeast, one out of every five women has a mercury level exceeding the EPA threshold. In New York City, it's one out of every four, and close to half of the city's Asian population have elevated mercury levels, as do two-thirds of the city's foreign-born Chinese. High-mercury pockets also exist on the West Coast. Between 2000 and 2001, San Francisco physician Jane Hightower tested 116 patients who said they frequently ate fish. She found elevated mercury levels among 89 percent of them, with half above 10 mcg/L. Many of these patients had reported nonspecific symptoms like headaches, nausea, depression, and trouble concentrating, and had been searching for an explanation for months or years. Since that first survey, Hightower has treated hundreds of mercury-exposed people from all walks of life. Among her patients was then-five-year-old Sophie Chabon, the daughter of Pulitzer Prize-winning novelist Michael Chabon and Ayelet Waldman, whose books include the best-seller Bad Mother. Sophie had been an early talker and walker, but then she seemed to hit a wall, suddenly unable to sound out words she used to know how to read and even forgetting how to tie her shoes. A blood test turned up mercury levels of 13 mcg/L. The culprit: twice-weekly tuna sandwiches. As Sophie cut tuna out of her diet, her mercury levels dropped, and her stalled development surged ahead again. Now in high school, she has a passion for history, film, and French and shows no sign of any lasting effects from the mercury exposure. Still, Waldman fumes when she thinks about what might have happened if they hadn't caught the problem so early. "I blame our country for not [caring] about what we're spewing into the atmosphere," she says. "This is about coal, pure and simple. You wouldn't go and break your child's bones one by one, but we tolerate this kind of poison that's ruining their minds. It's insane." While Hightower's wealthy patients tend to eat sushi and expensive tuna, swordfish, and halibut, poor Americans eat canned light tuna—often subsidized by the federal Women, Infants, and Children nutrition program—and fish they hook themselves in local rivers, lakes, or bays. Immigrants are particularly likely to fish for food, often without understanding the risks of eating their catch. The average Latino angler, for instance, consumes twice as much mercury daily as the EPA considers safe, while a 2010 study of subsistence fishing in California found that some anglers were getting 10 times that dose. The same study found that anglers with children had a higher mercury intake than those without, probably because families with more mouths to feed rely more on food that can be caught rather than bought. The boardwalk in Ocean City, New Jersey, is a 2.5-mile strip of salt air and stimulation, with arcades and carnival rides, pirate-themed mini golf and fried clams. It was here that a young woman named Jaime Bowen stood in front of a microphone in June and nervously contemplated the crowd. A 31-year-old home-healthcare worker with two children, Bowen had gone to a Sierra Club-sponsored hair-testing event with an environmentally minded friend a month before, more as a lark than out of any real concern for her health. "It was kind of a joke going to get my hair clipped," she says. "Then, to get the results—it was a reality check." Of the 36 people at the event who were willing to share their results, 8 had elevated mercury levels. Bowen was one of them. Hers was 1.37 ppm—too low to cause health problems, but higher than the EPA considers safe for women of childbearing age. (Hair mercury levels are evaluated differently than blood mercury levels, but a hair level of 1.2 ppm is roughly equivalent to a blood level of 5.8 mcg/L.) Now she was concerned about her two children, who, after all, ate what she ate. "You hear, 'Don't break that thermometer.' You never hear about the fish," she says. "I made my kids tuna fish sandwiches the other day, and now I feel horrible. Tuna fish—it's just one of those things you wouldn't think to be scared of." And so Bowen stood at the podium, gripping the paper that held her prepared remarks. She talked about fish and her fears about her children's safety, and about coal. To her surprise, she looked up to see that people up and down the boardwalk had stopped to listen. "I did want them to know," she says. "I'm just a regular person—I'm not doing anything different than those people." Behind her, the ocean sparkled, sending salty breezes drifting over the boardwalk. A seagull circled, white and gray, its bright eyes scanning the scene below: the crowded boardwalk, a fish-filled sea, and, tucked in a bay just a little to the northwest, the lighthouse-shaped smokestack of the BL England generating station, producing 450 megawatts of electricity, powered by West Virginia coal. Dashka Slater is a regular contributor to Sierra. Her Web site is dashkaslater.com; she tweets @DashkaSlater.